Touring Bottleneck Drive is easy to do and undeniably beautiful. Distinctive signage will lead you to our nearest tasting room locations throughout the stunningly scenic Summerland area. 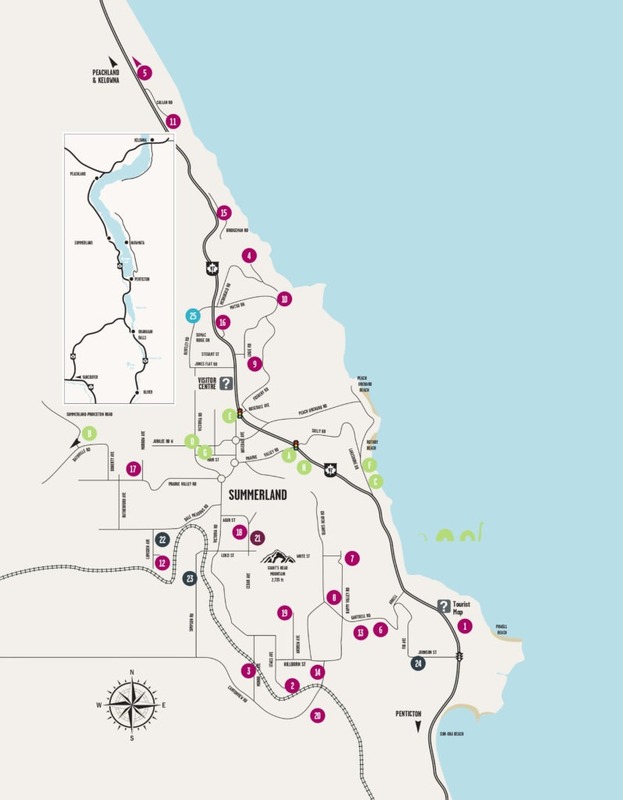 Maps are available at any of our tasting rooms or Okanagan Visitor Centres. Pick up a Bottleneck Drive passport at the local Visitor Centre or any of our tasting rooms. Collect a stamp at five Bottleneck Drive locations, and you can enter into our monthly draw for a chance to win delicious wine, cider, and beer! From North to South or vice versa, enjoy exploring the sparkling wines of Summerland! From North to South or vice versa, discover our orchards and urban tasting rooms and all they offer! Looking for a biking adventure in Summerland? Explore by bike care of Taryn Eyton of The Happiest Outdoors website. Visiting 3 Organic Wineries and 2 Cideries. Looking for tips on creating your own route?